I'm about a quarter of the way through this book, and have enjoyed it/learned a lot so far. Much like her author event I attended, Lorraine Massey's book leads the reader through some "curly girl pep talk" (feeling good about your hair, rather than fighting it), some education about the scientific nature of curly hair (it's dry & needs lots of hydration), identifying your curl type, and then gets into the care and maintenance of curly hair. The book also includes chapters on coloring curly hair, caring for curly-headed children, caring for men's curls, and curly up-do's. Before reading this book, I believed I had always been pretty ok with my curls, and what they contribute to my personality. But upon reading the introductory chapters, and Massey's own history, I was surprised by the number of memories of elementary school angst that came back - of my mom always styling my hair for me on school picture days, so it would look "acceptable", of a schoolmate nicknaming me "Medusa" when we did a silhouette project in the 6th grade, of going to the hair stylist with picture after picture of cool hairstyles from magazines, only to hear, "Now, Angie, you know it won't look like this on you, right?" While I don't think I ever really hated my hair, I certainly didn't embrace it, and this book helped me recognize some moments from childhood for what they actually were - fighting my natural state. And, at the risk of sounding overly dramatic, I believe there's a life lesson there - you can fight your true nature all you want, but it's always going to be a fight, and will rarely turn out like the perfect scenario you envision. Better to embrace and nurture what gifts you have, and learn to enjoy them. Studying this, and starting to use the Massey's DevaCurl hair products, has really changed how I treat and handle my hair. For example, I'm much gentler with it, use a lot more conditioner, and use a t-shirt to absorb the water after a shower. This book offers lots of concrete tips like those to help you better handle curls, without damaging them, or causing frizz (a lifelong bane for me!). The book includes many hair puns and is written in a very conversational tone, which may not appeal to everyone. But I found the information provided more than outweighed any eye-rolling on my part due to the writing. The DVD that came with the book was only so-so - it was helpful to see how Massey recommends washing curly hair in the shower, but that was about it. The home remedy recipes were ok, but she didn't show how to apply them, nor do I foresee myself using them. I would have liked to see more how-to on the up-do's and other hairstyles, too. The section on trimming your own hair also didn't work for me - looked like a long and tedious process to me, and one I don't anticipate trying. Overall, I highly recommend this book for any Curly Girls, or parents of curly-headed children. It will definitely change the way you view your curls. Just listed - new geek gift ideas for the holidays! 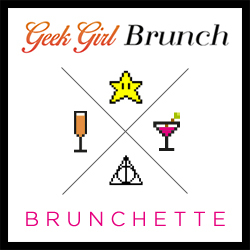 More on Geek Girl Brunch plus geek ornaments!